A lot has been said about the comparison between the matai system and the military. What do you think? Is the matai system like the military? I do not agree with what the Commissioner said. I am a matai myself and the way we look after our family and village is with love. That’s how it was from back in the days and that’s how it is nowadays. The fa’amatai is not like a military. This is our culture, is governed by love and respect. Life changes, everything changes even the people but the culture and tradition of Samoa will remain the same. I strongly disagree with such a view. The fa’amatai was never and will it ever be like the military. 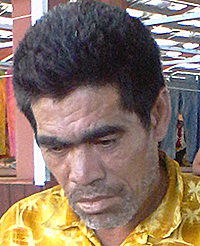 The pulega of the villages is steeped in tofa and moe of the elders. It is through dialoging and conversations where solutions are found. That is the matai system I know. The traditions and culture of Samoa depends highly on God so therefore it is not a military. Far from it. We do things out of love, compassion and respect. That’s the real Samoan way. Besides, we don’t carry guns around and issue orders. That’s the military way. People have different views on what the Police Commissioner had said. Maybe he was too quick to say what he had said. I assure you and everyone in Samoa that the fa’amatai is not like a military. It’s with love and respect that we do it together with God’s love. I don’t think the faamatai is like a military because I’m also a matai and that’s not how we run things in the villages. Love is the key to the fa’asamoa and the fa’amatai. Our traditional way is conciliatory and we give others the chance to be respected. So I don’t share those views and I wish he didn’t say that. I guess the reason why the Commissioner had said that was because the people are very hard headed. I know he didn’t mean to disrespect the fa’amatai or anything like that but I guess that people also interpreted the wrong way. The fa’amatai is not like a military. We are a family.